I HAVE JUST GOT IN THE POST SOME AMAZING PRIZES TO ADD TO THE SCOOP OF STUFF FOR THE WINNER OF THE VELOGAMES MINI GIRO LEAGUE. TODAY’S LITTLE HAUL IS FROM C3 PRODUCTS AND SPORTFUL. 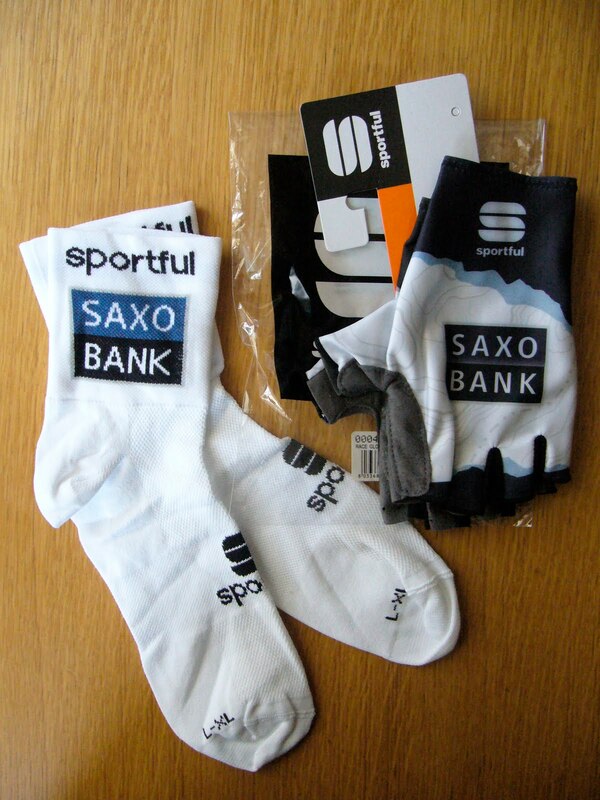 HERE ARE SOME SAXO BANK MITTS AND SAXO BANK SOCKS. THANKS SO MUCH C3 PRODUCTS AND SPORTFUL IT IS MOST APPRECIATED. I REALLY WANT THIS STUFF AND ADDED TO THE PRIZES ALREADY WHOEVER WINS THE LEAGUE IS GOING TO HAVE A NICE LITTLE TREAT COMING. THE SMART THING ABOUT ALL THE SAXOBANK STUFF IS ITS ALL TEAM ISSUE STUFF NOT JUST REPLICA PRODUCTS SO IT IS THE ACTUAL STUFF THE PROS WEAR. ITS THE SAME MATERIAL SAME CUT AND FIT. SPORTFUL IS ACE BECAUSE OF THAT. IF YOU DONT WIN THE PRIZE NEVERMIND THOUGH AS YOU CAN BUY THE EXACT SAME STUFF AT WIGGLE BY CLICKING HERE. AND SEEING AS I’M GOING TO WIN THE LEAGUE AND KEEP ALL THE PRIZES THIS IS WHAT YOU ARE ALL GOING TO HAVE TO DO ANYWAY.